The Joseph P. Manning school is a K-5 Boston Public School in Jamaica Plain. We have an instructional focus on higher order thinking skills and an inclusion program that supports success for all of our children. Our small size allows us to develop meaningful relationships with students so that we can individualize our instructional strategies and students’ social development but can make fundraising challenging. 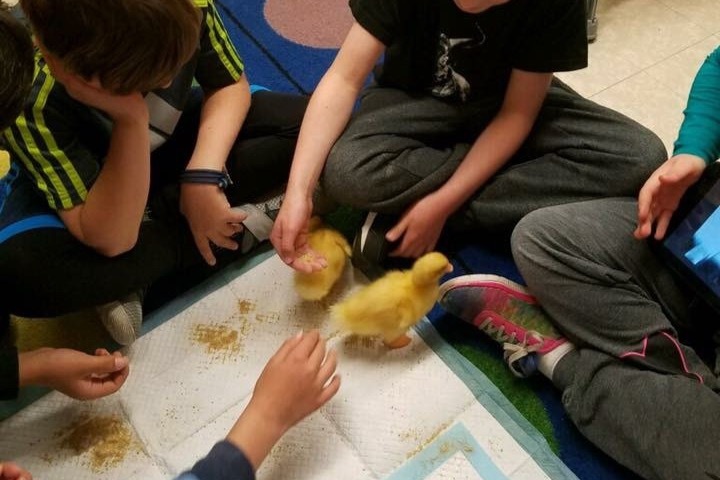 Each year, third grade Manning students study the life cycle by hatching ducklings or chicks. They follow the ducks/chicks from eggs to ducklings/chicks and finally go on a field trip to return the ducks/chicks to a farm. As you can imagine, the kids love this unit and are engaged in the candling, hatching and development of the chicks; they have so much fun experiencing the life cycle and form bonds that inspire some of the children to return to the farm and visit their ducks/chickens even after they've said their formal goodbye. In order to give the students this opportunity, we need to buy a new incubator, in addition to the eggs, food and other necessities. This will cost approximately $2000. We’re aiming to raise this money now so that we can begin the 2018-19 school year focused on learning and not fundraising. PLEASE HELP US REACH OUR GOAL by donating any amount you can. Our students (and their caregivers) will be so grateful! We went past our goal! Thank you to everyone who donated and shared! WOO HOO! We've hit our goal! Thanks to all of you who donated, the kids will get to study the eggs and care for the chicks before returning them to the farm. This is amazing. We are so close... Please share to help us cross our goal. We're almost 3/4 of the way there! This is amazing. It's so very appreciated.